Easily make information and offers known to guests using screens in public spaces or TV sets in their rooms. 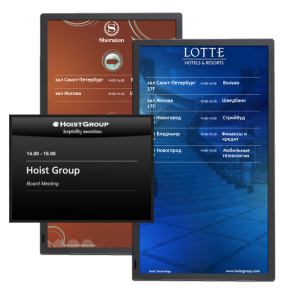 Our Conference Guide Digital Signage system acts as a guide for conference participants. Monitors located at reception, outside conference rooms and at other strategic locations tell participants which venue they should go to and how to get there. Conference Guide is supplied as a cloud service, so you don’t need a local server with administration tools installed. Instead, you can easily update your content online. It provides an overview of all conference rooms and all screens are updated simultaneously when you add new information. When no conferences are being held, you can use the screens to display other information. Our Info Channel works like your hotel’s own TV channel and can be shown on TVs or Digital Signage screens in your lobby, restaurant and other areas. Info Channel lets you increase your hotel’s additional sales by informing your guests about opening hours at the restaurant and spa, your restaurant menu, room service and weekend offers. It is also a good tool for collaborating with other businesses as you can offer them advertising space on your Info Channel. Info Channel is a cloud service, so no local server with administration tools installed is required. Instead, you update your content online. It supports several different formats and can show films, images, text and more. Would you like to know more about our TV solutions?